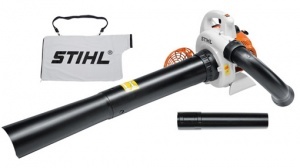 Increase the versatility of your STIHL blower. This attachment nozzle has a narrow profile, which ensures high air speed and makes it perfect for removing stuck on debris such as wet leaves. As it is also curved, it means you can more accurately target dirt and debris, as well as reaching under foliage or into tricky areas. Suitable for the STIHL BG 56 C-E, BG 86 C-E, SH 56 C-E, SH 86 C-E, BGE 71 and the SHE 71. To Fit: Models BG 56 C-E, BG 86 C-E, SH 56 C-E, SH 86 C-E, BGE 71 and SHE 71. 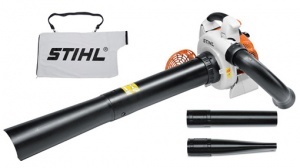 An extremely quiet electric mains power blower from STIHL, with powerful blower capacity. Perfect for noise sensitive areas. STIHL's SHE 71 is a handheld blower vacuum unit, giving you the versatility and adaptability to tackle a range of garden cleaning jobs. Lightweight and quiet yet providing powerful operation. 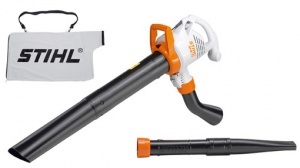 A powerful hand held petrol blower from STIHL, featuring ErgoStart technology to ensure smooth starting, a multifunction handle for additional ease of use, and environmentally conscious additions. An extremely powerful hand held blower with ErgoStart technology. This is a top-of-the-range machine with added comfort features that makes it ideal for professionals that will be using it for long periods. The SH 56 C-E is a versatile and adaptable machine, able to vacuum and shred debris, as well as blowing it clear of paths or driveways. Powered by a low emission engine. A comfortable and convenient professional shredder vacuum / blower, with increased vacuum power and shredding performance. With STIHL's ErgoStart technology included as standard.